« How Will Disney’s Acquisition of 20th Century Fox Affect Theme Parks? No matter where you sit politically, American politics have been a bit crazy lately. No one is more aware of how passionate people are about politics these days than Disney. Donald Trump joining The Hall of Presidents reopening has been something which has been the topic of much debate lately, if my sources are correct. And assuming those sources are accurate, the Hall of Presidents has actually been ready to go for a few weeks now. In reality, Disney was waiting for a slow news week where that wasn’t some sort of political scandal (on either side of the aisle) so news organizations wouldn’t make too big of a fuss about it. As luck would have it, the two busiest weeks of the year are approaching at the Magic Kingdom and capacity crowds are about to reign down on the park. Thus capacity was needed and the doors semi-quietly opened at The Hall of Presidents with Donald Trump standing front and center on December 19, 2017. Don’t believe me that Disney has concerns about this new attraction opening up? Let’s look at a few facts. Think about this for a second. We knew three and a half months in advance when Pandora was opening at Disney’s Animal Kingdom. That announcement was made February 7th for a May 27th opening. One could certainly make the claim that Pandora is a bigger draw than the Hall of Presidents and indeed it is. However, we knew what kind of special cupcakes and treats were being served up at Mickey’s Not-So-Scary Halloween Party on August 17th, a full week before the first party night of August 25th. Disney (and every other theme park company on planet Earth) likes to let you know what’s happening in advance so you can plan your vacation accordingly and it really didn’t happen with Donald Trump joining The Hall of Presidents. One can certainly make the claim that the show just wasn’t ready and Imagineering only gave operations less than 24 hours notice that the show was ready for guests, but that doesn’t make a lot of sense for many reasons. WDI (and any contractors) are given deadlines as to when they need to turn an attraction over to operations. Not to mention, The Hall of Presidents needs to have operations Cast Members staffed and ready to go at least a few days before even a soft opening. It makes absolutely no sense that Imagineering had no idea when Hall of Presidents would be ready 24 hours in advance. Take a look for yourself. The Disney Parks Blog did indeed run this story on their website. It carried a very carefully worded message, trying their best to tiptoe around any kind of political drama. 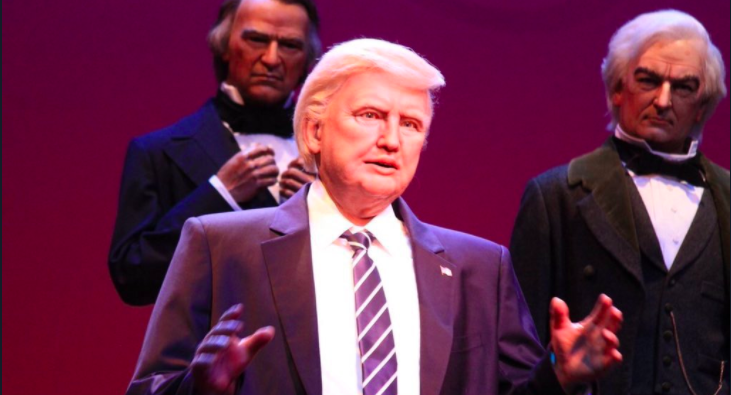 “As has been the tradition with every new president since the attraction debuted, an Audio-Animatronics figure of President Donald J. Trump has been added to the show and features the latest advances in technology that enable smoother and more lifelike movements. President Trump personally recorded remarks exclusively for The Hall of Presidents, just as each sitting president has done for the attraction since the early 1990s.” In other words, he speaks because every other sitting leader has done so since Bill Clinton, please don’t make a big deal about this. More importantly, the comments for this story (as of the writing of this article) are all positive. Regardless of where you sit politically, you’d be hard-pressed to find ANY story about Donald Trump without people getting passionate in some form or another. Yet, magically, the only comments that can be seen pertain to readers being happy that Hall of Presidents has reopened. Finally, Disney Parks Blog has gone to great lengths to bury this story. Seriously. Go check out the home page and see if you can find it. Click on the latest stories about Walt Disney World. 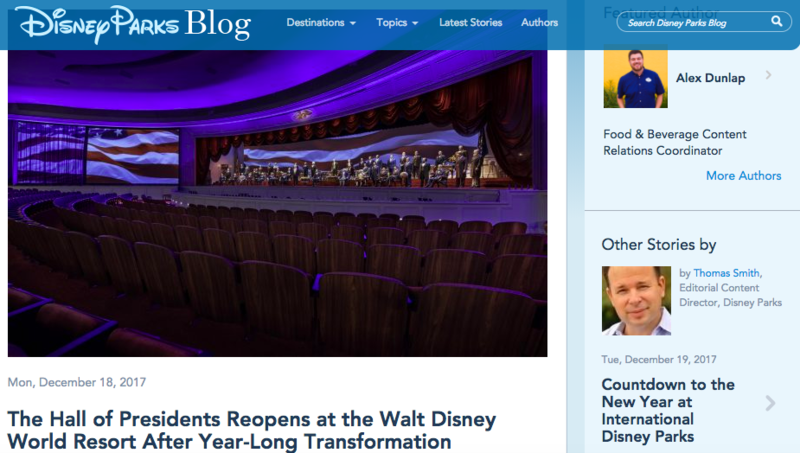 Click on the latest stories and you’ll notice there is no mention about The Hall of Presidents. It’s as if it vanished. Yet if you do a google search for it, indeed it is right there. Interesting to say the least. Not to mention you can’t find this at all on the Disney Parks Blog Twitter or Facebook accounts… coincidence? Maybe this went over the heads of most people, but I found it a bit jarring. Going back to Bill Clinton, George W. Bush and even Barack Obama the sitting President of the United States was always introduced as such. With Bush and Clinton, the previous President was given the EXACT same line before they were introduced. That has been the tradition and frankly, that introduction hasn’t changed much over the years. However, the narrator doesn’t refer to Donald Trump as a President before launching into his speech. In the current show, George Washington recites the exact same speech he used during the previous version of The Hall of Presidents. This time there is no pause between the oath and Trump’s actual speech. Sure, we know he is President of the United States, but don’t you think it is a bit odd that he didn’t get a brief introduction like the previous speaking Presidents? No matter whether or not you agree with the first three points in this article, this may be the most interesting fact of all. 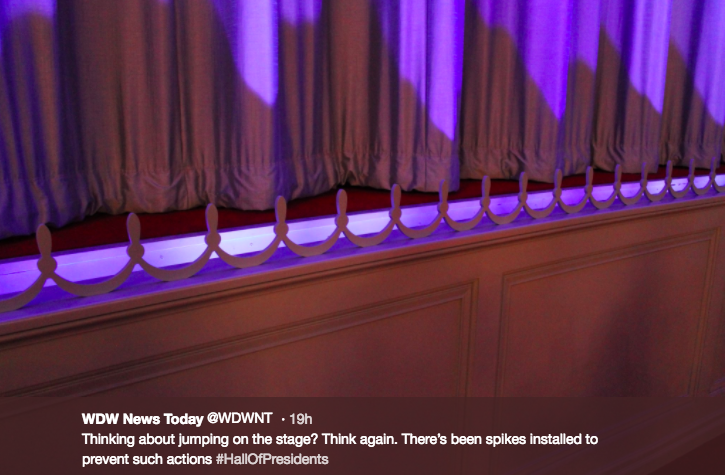 For the first time in the history of Hall of Presidents, small decorative “spikes” were added around the entirety of the stage. The only reason why Disney would add this “decorative” feature is to prevent people from rushing the stage and potentially ruining the figure. Think about it, if you’re sitting in the front row of Carousel of Progress, you’re less than five feet away from animatronics. While there are sensors there that trigger a show stop if someone were to try something stupid (look for them on your next visit! ), spikes have been unnecessary for that Tomorrowland attraction. 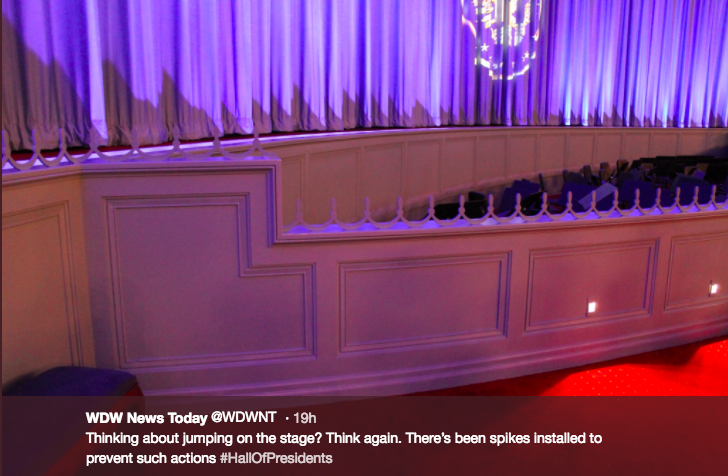 Yet for some reason, Disney made it more difficult to get on stage at the Hall of Presidents. Coincidence? The point of this article is to show just how different Disney is handling the current version of the Hall of Presidents than they have in the past. The political climate is undeniably passionate, arguably more than it has been in the history of the United States. We have said it before and we will say it again, the controversies at Hall of Presidents will only get worse over time and it may be time to throw in the towel on this classic attraction sooner than later. The only way to do that without ruffling too many feathers is to announce the closure far in advance of the next election (or the one after that). That way, no matter how it sways, Disney stays away from the controversy it so dearly tries to avoid. Your thoughts? Wait! As promised, we are going to continue the tradition of #IReadTheEntireArticle. As a thank you for being a Theme Park University reader, I’ll pick one person at random to receive a $10 Amazon gift card if you post a comment on any of our social media channels (Facebook or Twitter) with #IReadTheEntireArticle. Just that easy. Please try and keep comments civil. It’s the holidays after all. A winner will be chosen at random on December 27, 2017. All entries must be received by midnight on December 26, 2017, at midnight EST. This contest is not affiliated with the Walt Disney Company, Amazon or any other themed entertainment company. This entry was posted in Disney and tagged Animatronics, Donald Trump, Hall of Presidents, political controversy. Bookmark the permalink. Trackbacks are closed, but you can post a comment.